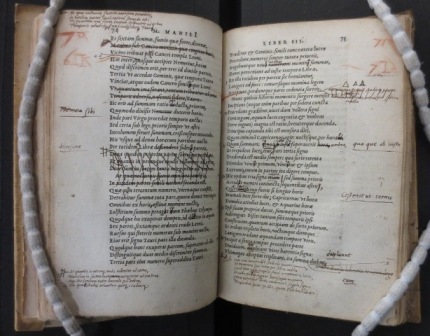 Copy of Scaliger’s 1579 edition of Manilius, with annotations and mark-up for the printing of the new edition. The second in this year’s series of classes, convened by Will Poole, on annotated books in Bodleian Library collections was led by Kasper van Ommen (University of Leiden, and Humfrey Wanley Fellow at the Bodleian Library). He examined annotated books from Joseph Scaliger’s library, showing examples that had come into Bodleian collections by a variety of routes; as gifts from Scaliger himself to Henry Savile [Savile Ee 1(5)] or by descent of owners after Scaliger’s library, by the terms of his will, was divided and the ‘books in foreign tongues’ given to University of Leiden Library, establishing an early collection of Middle Eastern and Asian-language books there; then Scaliger’s friends including Daniel Heinsius, Van der Myle and Baudius had the pick of the learned books in Latin and Greek; and the remainder of his library was sold at auction. By these means, particularly through the later sale of the books of Daniel Heinsius’s son Nicholas, many of Scaliger’s books bearing his annotations were dispersed and some came into the hands of English scholars and collectors. Some 27 books from Scaliger’s library or sent as dedication copies by him are in the Bodleian now. Introducing the history of Scaliger’s library, Van Ommen pointed out that he was a ‘star professor’ of the late 16th century, and that his gifts of his own works to respected friends reflected both his productivity and his self-regard. This backfired with his presentation of the Cyclometrica to Henry Savile of Merton College, Oxford, who was not impressed with Scaliger’s claim to have squared the circle (a controversy in which John Wallis, a later Savilian Professor of Geometry, was similarly engaged with Thomas Hobbes in the middle of the 17th century). Carrying the theme of discovering printed books that are unique by virtue of manuscript additions or annotations, the class examined a volume annotated by Scaliger, the 1579 edition of his own publication of Manilius’s Astronomicon, marked by him for the second (authorized) edition, and also marked in red crayon by the printers in Leiden as a copy-text for the 1600 publication. [Bodleian Library Auct. S 6.12] The volume also has added index entries as seen in the second image here. The class discussed parallels between the Leiden and Oxford; did Thomas Bodley, a diplomat based in The Hague from 1588 to 1597, regard Leiden’s library as a model for the Bodleian, which he later founded as an ‘Ark to save learning from the deluge’ – an echo of the Arca Scaligeri, the cabinet made to hold Scaliger’s Oriental books when they came to the Leiden library? 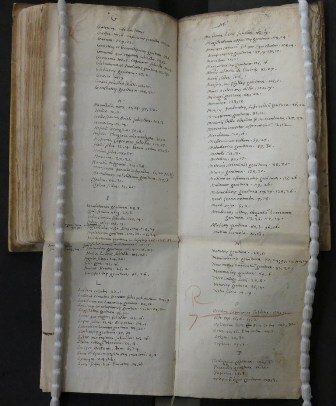 Each provided early catalogues of scholarly books, the Nomenclator of Leiden in 1595 and Thomas James’s 1605 Catalogus librorum bibliothecæ publicæ. http://www.livesandletters.ac.uk/cell/Bodley/transcript.php?fname=xml//1589//DCB_0802.xml. This was prepared under the direction of former Humfrey Wanley Fellow, Robyn Adams. Added ms. index in Bodleian Auct. S 6.12.